At Quilts Plus, 1748 E. 86th St., you can enroll in Quilts Plus University, a series of ten classes that starts with Beginning Quilting and covers piecing, cutting, appliques, binding and popular patterns. Prices range from $15 to $45 per class. If you live in or near Fishers, try Quiltmakers, on Allisonville Road just north of 116th Street. 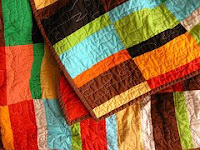 The shop offers an introductory Quilt Primer class ($30), plus a dozen other introductory classes for specific techniques and patterns. If you're in the Carmel area, head to Quilt Quarters for its Beginning Nine-patch Quilt class ($45). When you've mastered the basics, you can take classes in specific patterns and techniques. Another option is your nearest Jo-Ann Fabrics store, which offers Quilting 101, 201 and 301. At my nearest store (in Castleton), each class consists of two three-hour sessions and costs $60.